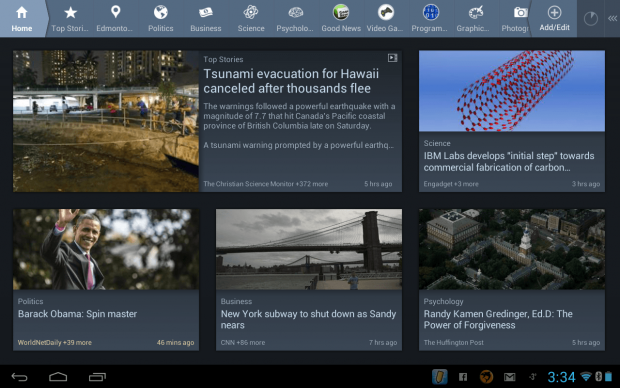 News360 for Tablet is a news aggregator that allows you to view the latest news stories from around the world. This app is for those who view the news regularly on their tablet and want a simple to use, yet powerful, app to bring together all of their favorite news sources. If you’re not a fan of the other news apps that are available on Google Play, then maybe it’s time you look into News360. And for all of those Android smartphone users, News360 has you covered with a smartphone version of this app. News360 is a simple, yet powerful app that is designed to deliver the news you want to your tablet. It brings together all types of news, from politics, technology, local news, and so much more. News360 is able to get this news from many different news sources, allowing you to even read the same news story from many different news sources if you wish — it’s all up to you. 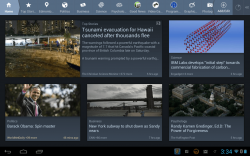 News360, like many other apps these days, offers a simple to use interface. Its user interface is appealing to the eye and is definitely optimized for the larger screen of a tablet, which is a must when you say that your app is for a tablet. When you first launch News360, you are presented with a simple interface that asks you to either “sign in” or “get started”; in my case, I chose get started, since this was the first time I had ever really used News360. You can speed up the sign up process by logging in with a wide variety of different social networks as opposed to manually creating a new News360 account. After that, you are asked to choose the topics that interested you, and there definitely aren’t a shortage of topics to choose from. Once I figured out what interested me, and what didn’t, I finished up that process and it compiled a bunch of news that was relevant to me. Unlike apps like Google Currents , this app asks you what topics interest you, not what websites interest you, which is actually a faster process when it comes to setup. Sure, reading articles is nice, but how about passing on that information to friends? With News360, you can do this. When you are viewing, what I like to call your news feed, you can swipe down on articles to reveal a sharing menu, where you can share an article via Facebook, Twitter, Google+, email, and much more. However, chances are you’re going to use those first four options much more than the other ones. Let’s say you want to read the same news story from a different news source, just to get the facts straight, or make sure that something isn’t a hoax. Well, News360 makes this a simple process by listing articles from other news sources on the same topic at the top of the article you’re reading, such as CNN, CBC, Reuters, BBC, and more. This is definitely very useful, especially for research. This actually, in my opinion, is probably the best feature of News360 — a feature not many other apps offer. You can also get a short list of news outlets that have reported on the same news story by swiping down on articles in your news feed; if you don’t see this short list right way, and instead only see sharing options, then just swipe down again. News360 isn’t just for global news that happens a few thousand kilometers away from you — it can also deliver local news to you. News360 does this by using your location; you can either do a manual search for your location, or you can just let the app find your location on its own using GPS. Once that’s done, you’ll be able to read news stories that are important to you locally. Overall, this app is fine and dandy. However, I did encounter a few issues with it, although they aren’t ones that are going to make using this app a nightmare. First off, earlier in this review, I mentioned that you can swipe down on articles in your news feed to reveal a sharing menu and a short list of different news sources that have reported on the same story. Although this is a nice feature, it takes a little longer to respond to your swipe than it should in my opinion. In other words, there is slight lag. The next issue I had, which is a little bit more significant than the last one, feels more like a bug than anything. Sometimes when you launch the app, or even when your are browsing news articles, News360 will say that it can’t load any news articles. The only way around this that I found is closing the app and relaunching it again. This is a feature that must get fixed in a future update, because it is quite annoying. Also what needs to be fixed is sometimes when you are adding more topics to your news feed, News360 doesn’t always respond to your input. In the end, this is definitely a high quality app and has had a lot of work put into it by the developers to make it what it is now. This is a very simple to use, yet powerful, app, and, on top of all that, its free. 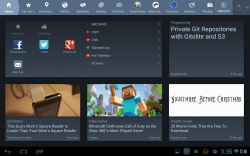 I recommend this app to anyone that is in search of a good news app for their tablet. As I mentioned earlier there is also a version that is available for Android smartphones, and all you Apple fans are in luck — News360 is also available on the Apple App Store.